Prior to the year 1897 Fraktur was clearly understood by everyone as an angular broken-lettered calligraphy or typeface. Thereafter an additional meaning was introduced that has redefined the way we think of Pennsylvania Dutch and Moravian material culture. In September of that year Henry Chapman Mercer gave a talk The Survival of the Mediaeval Art of Illuminative Writing Among Pennsylvania Germans to American Philosophical Society members in Philadelphia. 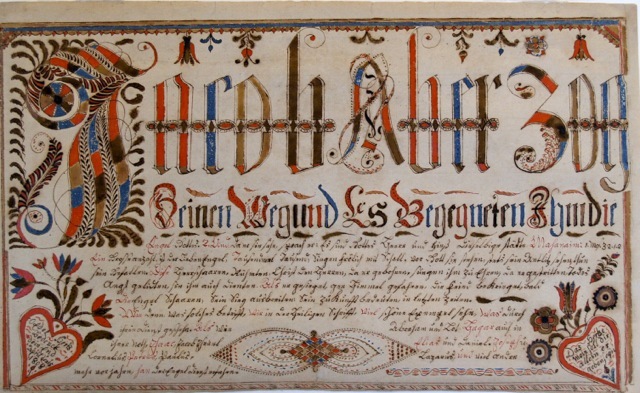 Most likely thinking of all the illuminated manuscripts containing both visual decorative elements, and Fraktur script, he suggested that all Pennsylvania German illuminated manuscripts be called Fraktur. However, people came to understand this as nomenclature for objects with or without Fraktur script. Since then, birds, flowers, geometric designs, etc. 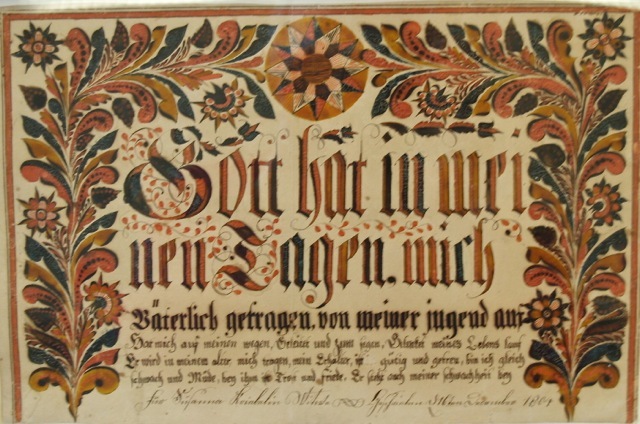 on paper, textiles, clay, wood, glass, metal, or stone with or without any text can be referred to as Fraktur. The material culture of both groups, therefore, is represented through visual, as well as written Fraktur. Fig. 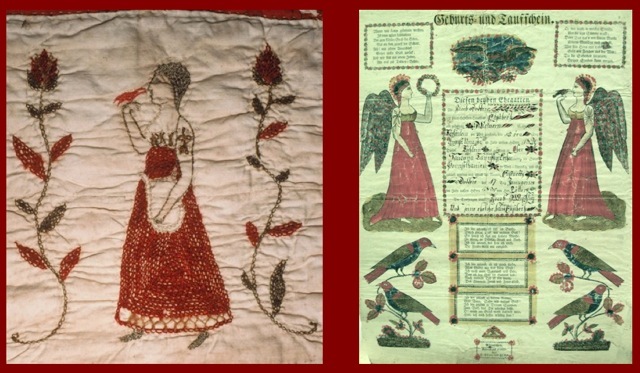 2 COMPARISON OF FRAKTUR WEDDING QUILTS WITH PA DUTCH FRAKTUR DESIGNS, 1820-1840 Courtesy of Moravian Museum of Bethlehem PA M849.01; Winterthur Collection 2000.0071; Schwenkfelder Collection, uncatalogued; Metropolitan Museum of Art, 2016.432. 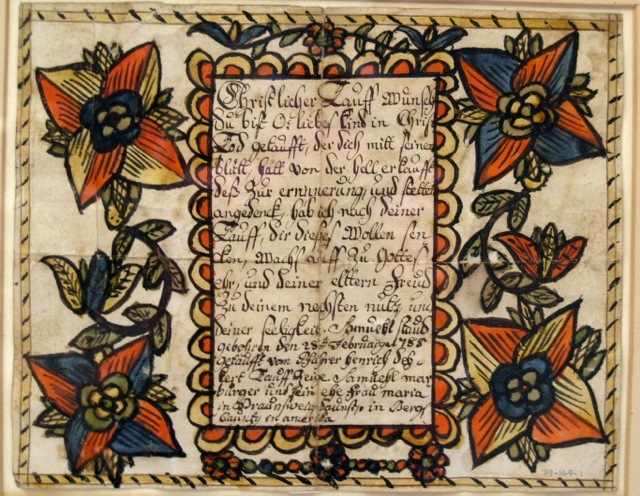 There are then two kinds of Fraktur quilts: one made up exclusively of blocks signed in Fraktur script;  and Fraktur quilts whose central owner/maker block is the only block to be embroidered with initials or name and date in Fraktur script, the remainder being pieced, embroidered or appliquéd with decorative motifs used by the Pennsylvania Dutch in all their media, and commonly called Fraktur. 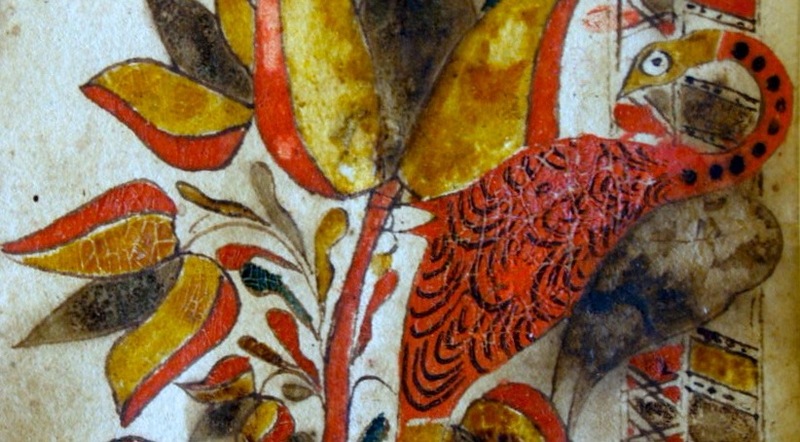 Most frequently seen on illuminated manuscripts, textiles and tombstones, they include geometric designs, doves, pelicans, peacocks, tulips, carnations, pomegranates, trees, stars, and so forth. 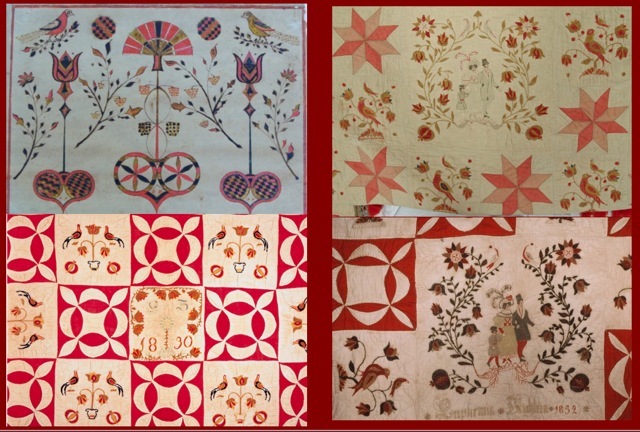 Members of the Schleifer-Kichlein family, (Küchlein, Kickline) created four such quilts using Fraktur script, and decorative elements associated with the material culture of the Pennsylvania Dutch, as well as, amazingly enough, embroidering in the center of two of these quilts a tambour worked  scene of the latest in fashion design for men, women, and children among both the American English-speaking society, and the well-dressed European family of the 1820s and 1830s. Fig. 3 FRAKTUR MOTIFS QUILT, INITIALED “E K 1829” Taken from John Joseph Stoudt . Pennsylvania German Folk Art, 1966, p.334. John Joseph Stoudt in his 1966 Pennsylvania German Folk Art (p. 334) cites possibly the oldest among the quilts, which at that time belonged to Mr. Oliver Lewis Christman, an antiques dealer and florist living in Pottstown, Pa. One of its blocks is initialed in Fraktur script “E K 1829”. 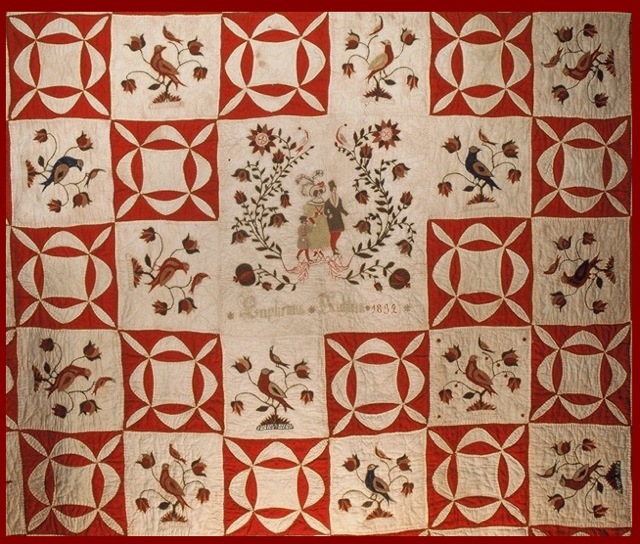 A pieced reel design, along with tambour embroidered Fraktur motifs such as two birds flanking a tulip tree, and French-knotted cherry trees are similar to those found in three other known quilts: an undated/unsigned quilt and two shams reportedly made by Christina Kichline ca. 1830 (Moravian Museum of Bethlehem, Pa, M849.01 & M849.02-01-02), and two other quilts, one initialed in Fraktur script “E S 1830” (Winterthur Museum collection, 2000.0071) in the center owner/maker’s block, and the other, also embroidered in the center owner/maker’s block, in Fraktur script as “Euphemia Kichlein 1832” (Metropolitan Museum of Art, 2016.432). Fig. 4 FRAKTUR MOTIFS WEDDING QUILT & SHAMS ATTRIBUTED TO CHRISTINA KICHLINE, CA. 1830. 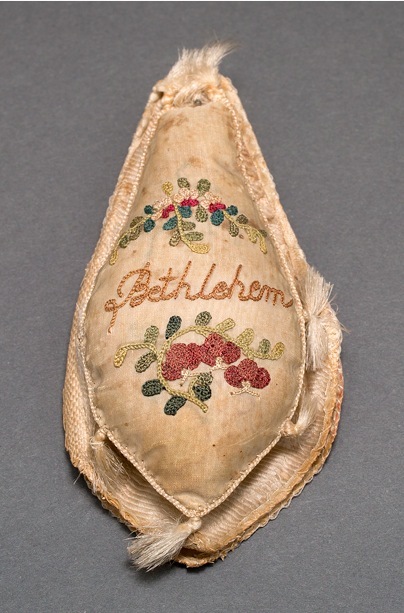 Courtesy of the Moravian Museum of Bethlehem, Pa., M. 849.01, M. 849.02-01-02. According to the Church Register of Christ Lutheran Church in Trumbauersville, Pa., Christina Schleifer (1795-1884) was born on 11/30/1795 to Heinrich and Dorothea Schleifer. Per the same records her brother John and she were confirmed in 1811. She was married to Jacob Kichlein (1795-1854), and was the mother of seven children,  three of whose death certificates—Charles,  John Abraham,  and Mary Ann Kichlein Applegate Christine,  confirm parentage as Jacob Kichlein and Christina Schleifer. That Christina was Euphemia Kichlein Scholl’s (1819-1884) mother is attested to by the 1880 United States Federal Census for Rock Hill, Bucks County, Pa. in which John Scholl, his wife Euphemia, and mother-in-law Christina Kechline are listed. The Commonwealth of Pennsylvania death certificate for William H. Scholl cites John Scholl and Euphemia Kichline (maiden name) as parents. Jacob Kichlein (1795-1854) was born in Rock Hill, Bucks County, Pa. on 4/9/1795 to Elisabeth Kepler (Köbler), and Johannes Kichlein (1768-1852). The U. S. 1850 Federal Census lists fifty-five year old Jacob Kichline as a tavern keeper in Lower Saucon Township, Northampton County, Pa., and head of a very large household including thirty-two year old Euphemia Kichline. He died in Lower Saucon, Northampton County, Pa. 9/28/1854. 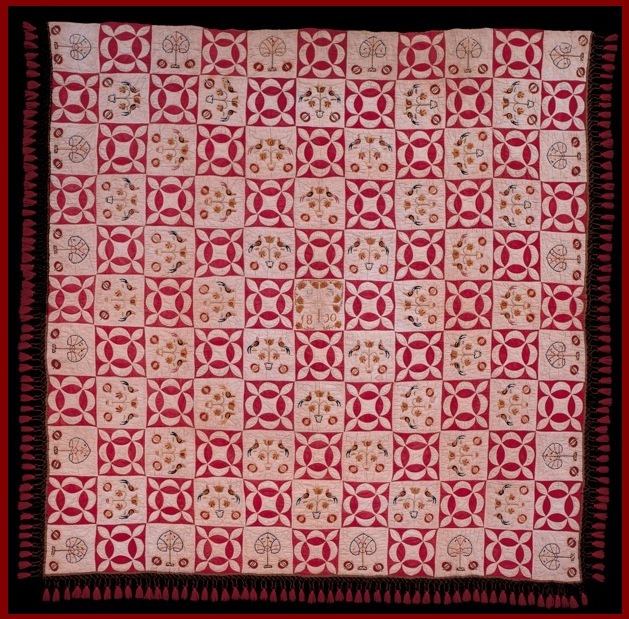 Quilt of red LeMoyne stars of wool on white cotton. Tambour embroidery in wool yarn of birds, tulips, trees, in blue, red and gold colors. Centerpiece tambour work depicts [a] man, woman [,] and child. Braid on 3 sides finished with fringe edges in red and grey is 4.5 inches long. Backed with white cotton. The accession report dates the quilt to ca. 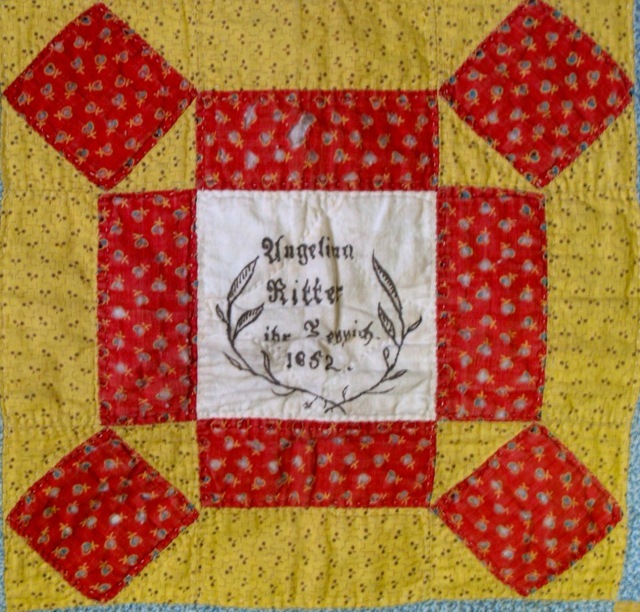 1830, noting that Christina Schafer [sic] [Schleifer] Kichline made this as her wedding quilt, having married Jacob Kichlein in 1817 at age 16. N. B. In 1817 she was twenty-two. The aforementioned information, along with a note that she carded the wool that was produced on land owned by the Unangst family near Quaker Hill in Northeast Bethlehem in 1815 comes from the original catalogue card. It is not unusual for facts to become blurred by time and memory. Neither are church records always right, but, as already noted, the official birth and baptismal entry for Christina indicates that she was born in 1795 and baptized in 1796. 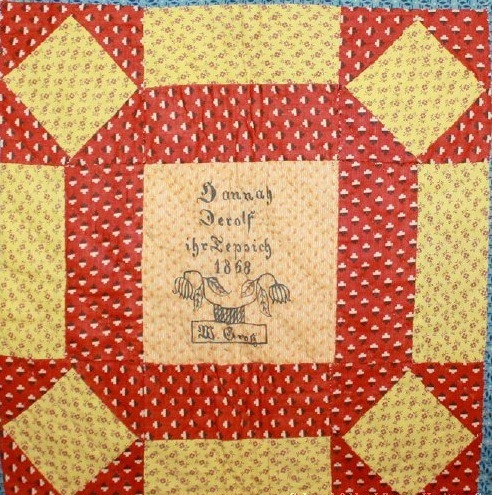 She would have been sixteen in 1811, the date she was confirmed at Christ Lutheran Church, not 1817, and 35 by 1830 when it is estimated the quilt was made. This is the work of a skilled needleworker. Christina may, indeed, have made it as a wedding quilt, but not for herself. 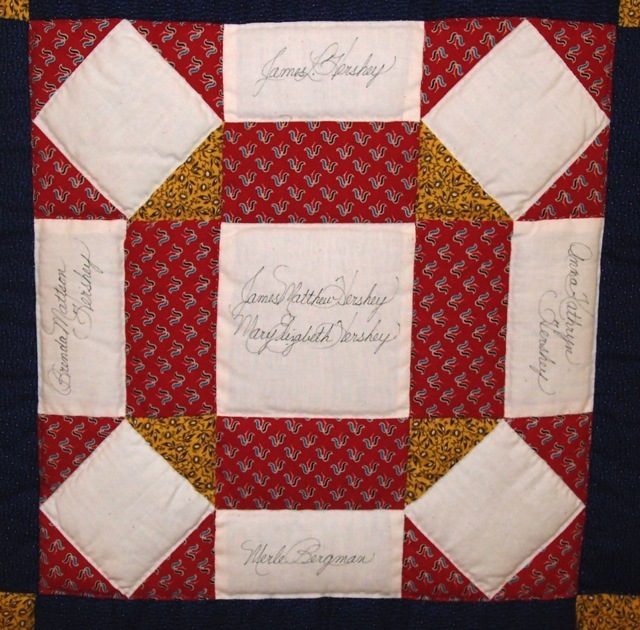 It was traditional for Pennsylvania Dutch grandmothers, mothers, aunts, sisters to make quilts for young boys and girls in the immediate family as early as age eight or nine for their Aussteuer, i.e. future wedding trousseau. 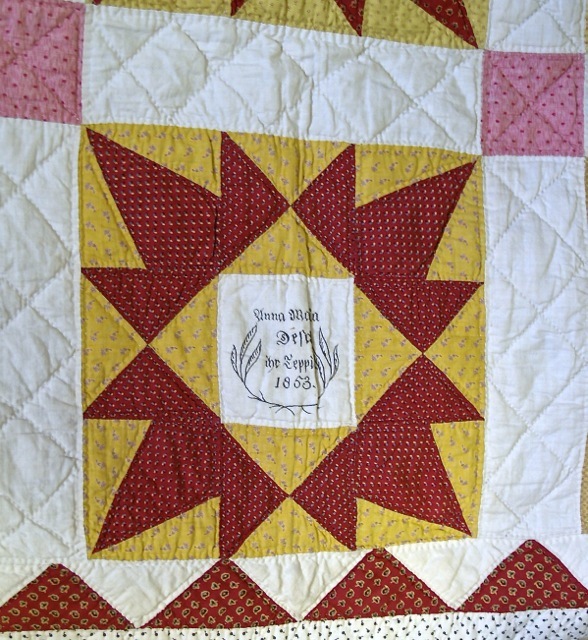 Finished quilts were stored away in dower chests waiting to be given several years hence to the now young man or woman when he/she “went housekeeping.” Christina could have made this quilt for any one of her then living children as a future wedding gift. 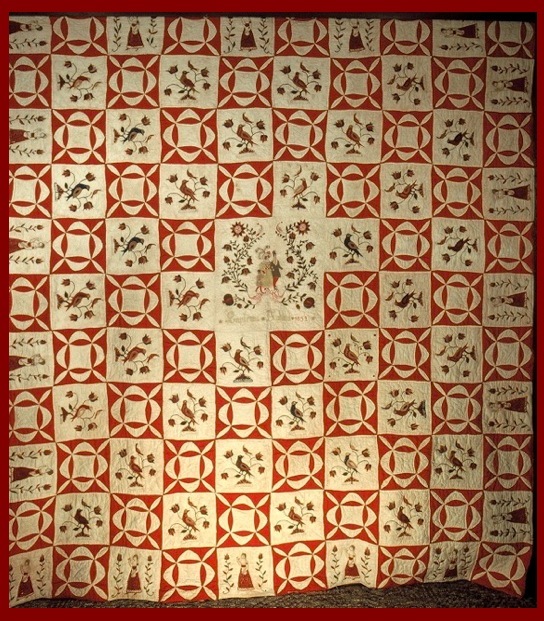 A similar quilt, in the Winterthur Museum Textile collection, replaces the LeMoyne stars with a reel pattern. French knotted cherry trees with pomegranates placed on either side alternate with the reel block to form an attractive border that, like the second example, is embellished on three sides with a braided edging finished in red fringe. Tambour work beautifully renders two birds flanking a tulip tree with trailing pomegranates, a design that is common to all quilts in varied forms. “E S 1830” is embroidered in Fraktur script on the center owner/maker block, and surrounded by flowering tambour worked tulip vines. At the moment we do not know the maker of this quilt, but can definitely say that it was someone within the Schleifer-Kichlein family. Fig. 8 ELISABETH KÖBLER EMBROIDERED TAUFSCHEIN 1830 & HEINRICH EBNER & CO. PRINTED TAUFSCHEIN 1822. Courtesy of the Goschenhoppen Historians, 1971.01.55 & Allentown Art Museum, 2009.006.031. Although not a quilt, a one-of-a-kind embroidered Taufschein owned by the Goschenhoppen Historians (1971.01.55)  is also linked to the embroidery achievements of members of the Schleifer-Kichlein family. It was embroidered by J K in 1830 to commemorate a special moment in the past, the October 9, 1776 birth of Elisabeth Köbler Kichlein, grandmother to Jacob and Christina’s seven children. Atypical for the Pennsylvania Dutch, this is a Taufschein intended to be hung on the wall and shown. Its frame, original to the work, encloses two embroidered pieces: The upper one shows the initials of the maker and date J K 1830 in Fraktur script, and the lower one the birth and baptismal certificate. The needleworker’s choice of decorative elements is an interesting combination of motifs contemporary to her time period such as the putto, angels, and birds from Heinrich Ebner’s printed Taufscheins of the 1820s, along with more traditional Pennsylvania Dutch sampler-like objects such as French-knotted cherry trees, embroidered sleek birds, and creeping tulip and other floral vines to form the border framing the text. The tambour work is not as finely done as in the quilts. The ever present baptismal verses announcing the brevity of life and importance of baptism usually found on printed Taufscheins of the period are noticeably absent from this piece. Although it is still unknown who embroidered it, and for what occasion, perhaps it was a fifty-fourth birthday present for a very special grandmother. Elisabeth’s parents Jacob and Christina Kerschner Köbler (Kepler, Keppel, Koepler, Käbler, Kebler, Kepple) were married 5/18/1762  in St. Paul’s Evangelical Lutheran Church in Coopersburg, Pa., a church still better known as the Blue Church for the bluish-hued plaster that once covered the outer masonry as insulation and protection. All of their children’s birth and baptismal records are in the Blue Church Register: Elisabeth was the fifth child of seven children. Her siblings included Johan Georg (2/23/1763); Johann Jacob (4/4/1765); Johannes (6/5/1771); Maria C. (2/20/1774); Elisabeth (10/9/1776); Andreas (3/16/1779); and Susanna (4/7/1781). According to a will registered in Bucks County on 4/10/1824 under File No. 5388, Volume 10 (1821-1831 wills), pp. 357-359, and probated 3/22/1825, her father Jacob is identified as a yeoman, late of Richland Township, Bucks County, Pa. He sets forth in his last testament how moneys and other assets are to be divided among his beloved wife Christina, children and grandchildren, and appoints Elisabeth’s husband Johannes Kichlein (1768-1852) and Jacob Smith as executors. Johannes and Elisabeth had two children John K. Kichline (8/24/1793-5/7/1865) and Jacob S. Kichline (1795-1854), husband to Christina Schleifer (1795-1884), and father of Euphemia (1819-1884), Jacob (1821-1911), Thomas (1823-1857), Mary Ann (1826-1908), Elizabeth (1832-1890), John Abraham (1835-1907), and Charles (1837-1916). Both Johannes and Elisabeth Kepler Kichline are buried, side by side, at Christ Church, old section in Trumbauersville, Bucks County, Pa., Plot: Row F1, F2. Fig. 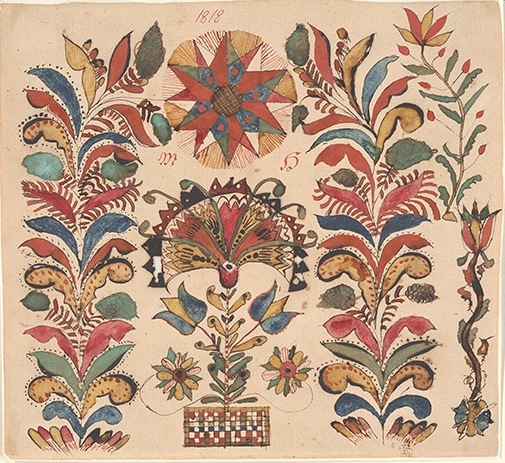 10 FRAKTUR MOTIF WEDDING OWNER QUILT BLOCK, 1832 ATTRIBUTED TO EUPHEMIA KICHLINE (1819-1884) Courtesy of Metropolitan Museum of Art, NYC, 2016.432. Photo © and courtesy of Patricia Herr. “Euphemia Kichlein 1832” is embroidered in Fraktur script in the central owner/maker block of the quilt now part of the Metropolitan Museum of Art’s Textile collection. 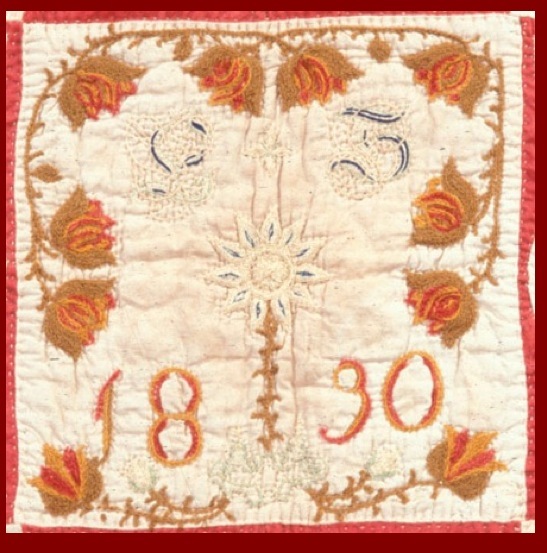 Euphemia was thirteen when this quilt was made. Perhaps an experienced family seamstress and she completed it together, or perhaps, as previously suggested, her grandmother, mother, or aunt created it for her Aussteuer or future wedding trousseau. Fig. 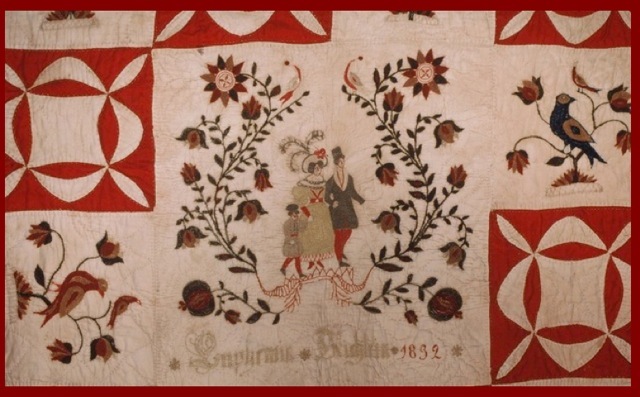 11 FRAKTUR MOTIF WEDDING QUILT SECTION, 1832 ATTRIBUTED TO EUPHEMIA KICHLINE (1819-1884) Courtesy of Metropolitan Museum of Art, NYC, 2016.432. Photo © and courtesy of Patricia Herr. The skillfully executed tambour worked variations of Pennsylvania Dutch bird and tulip tree designs alternate with the pieced reel pattern. Fig. 12 FRAKTUR MOTIF WEDDING QUILT FULL-VIEW, 1832 ATTRIBUTED TO EUPHEMIA KICHLINE (1819-1884) Courtesy of Metropolitan Museum of Art, NYC, 2016.432. Photo © and courtesy of Patricia Herr. The reel pattern is used again in the border, alternating with an angel familiar to those of us who spend time with printed Taufscheins. She balances a bird on her uplifted right hand, and holds a lyre in her left, but shorn of her wings, is now mortal and forever fated to remain on earth. Fig. 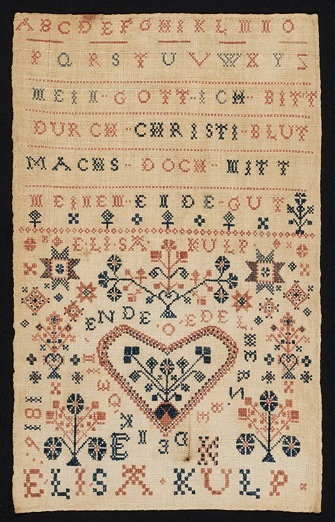 13 FRAKTUR MOTIF WEDDING QUILT BORDER BLOCK 1832, attributed to Euphemia Kichline (1819-1884), and HEINRICH EBNER TAUFSCHEIN, ca. 1830 Quilt courtesy of Metropolitan Museum of Art, NYC, 2016.432. Photo © and courtesy of Patricia Herr; Taufschein courtesy of Allentown Art Museum, gift of Mr. and Mrs. Arnold Kaplan, 2009, 2009.0060.030. Photo courtesy of AlyssumArts © DL Moyer. 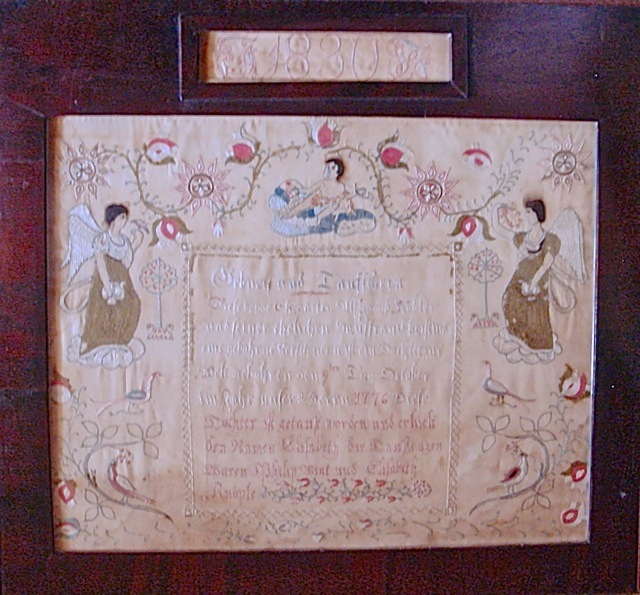 Unlike the winged angel on the Elisabeth Köbler embroidered Taufschein, who still can access celestial realms, the wingless quilt angel, probably copied from a Heinrich Ebner Taufschein of the early 1830s, is destined to walk forever among the tambour worked flowers of this quilt border. Such was the imagination and will of its designer and maker. The Moravian Museum of Bethlehem and Metropolitan Museum of Art quilts feature in their center a strolling couple with a young boy. The man, woman, and child are worked in tambour stitch and boast the fashionable styles worn in the 1820s and 1830s by both discerning English-speaking Americans, as well as trendsetting Europeans. Tulip vines and flowers create an arbor-like frame around the scene. 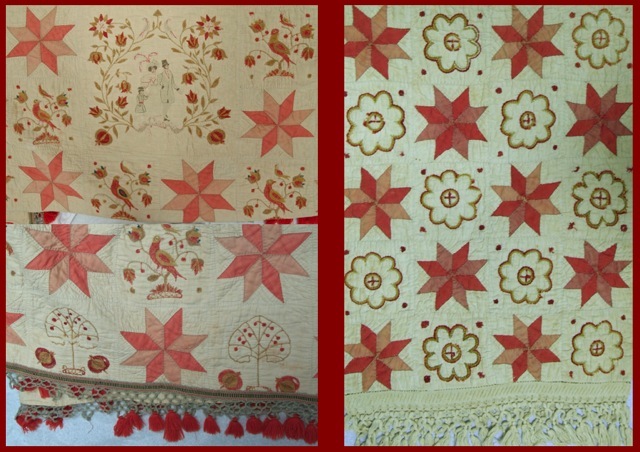 Such an addition to quilts principally embellished with Pennsylvania Dutch inspired stars, birds, wingless angels, tulip trees, and pomegranates is unique and quite unexpected. 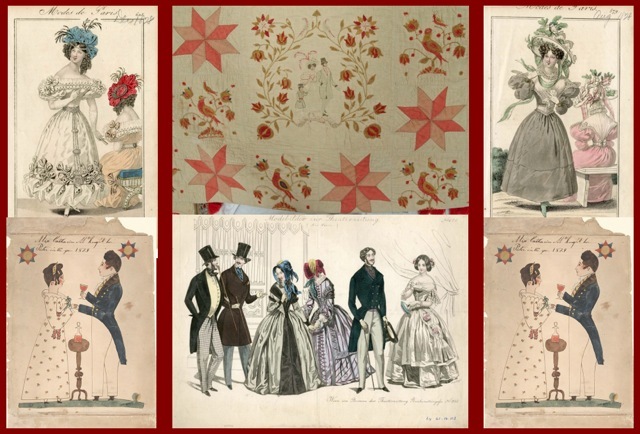 However, if we turn to three fashion plates of the period taken from the Metropolitan Museum of Art’s Costume Institute Fashion Plates: 1800-1866,  we can see the similarity in dress and perhaps the inspiration for the figures on the quilts. Also, Henry Young’s 1829 Fraktur drawing of “Miss Catherine McKnight her Picter in the year 1829” shows us an example of the fashion and style of the time in which the quilts were made. Local sources would have included newspapers, and the extremely popular Godey’s Lady’s Book, a magazine founded by Louis Godey in Philadelphia in 1830 with monthly detailed descriptions of the latest in modish clothing and hand-colored fashion plates. Fig. 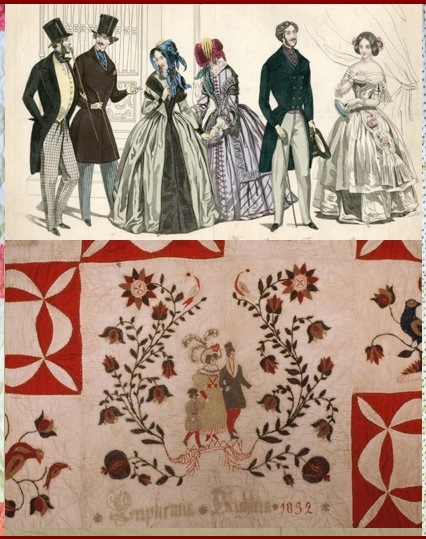 15 METROPOLITAN MUSEUM OF ART FASHION PLATE, Courtesy of the Metropolitan Museum of Art Fashion Plate 034, and FRAKTUR MOTIF WEDDING OWNER QUILT BLOCK, 1832, attributed to Euphemia Kichline (1819-1884) Courtesy of Metropolitan Museum of Art, NYC, 2016.432. Photo © and Courtesy of Patricia Herr. Although the Schleifer-Kichlein family’s roots were firmly anchored in Pennsylvania Dutch customs, they were also tavern keepers; served the general public; and participated in the contemporary life of the 1820s and 1830s. It was a time of vast change in America. Young people were crossing cultural boundaries, and even as today, merging and blending different cultural milieus. So, perhaps embroidering clothing advertisements directed at English-speaking Americans onto the center of two quilts family needleworkers had otherwise embellished with traditional decorative Fraktur motifs, was an artistic and creative way to express the acculturation of the time period, featuring what was precious from the past while introducing the lifestyle of the present. 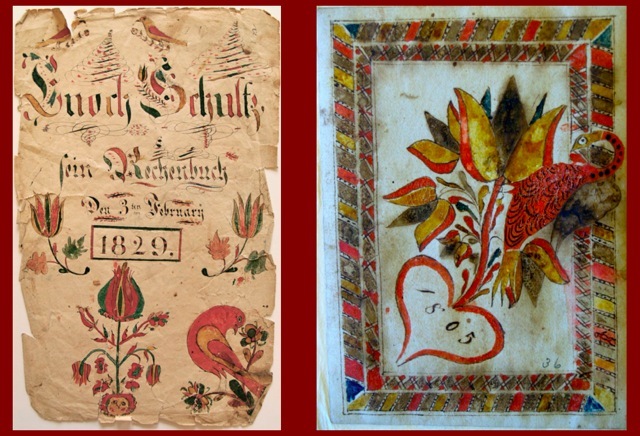 For more detailed information on this type of Fraktur quilt, see Pennsylvania German Blog Post Nr. 8: Friendship-Fraktur-Signature Quilts. Tambour work is a needlework form that derived its name from the drum-shaped frame used to stretch the fabric. Instead of a needle, a tiny hook draws a loop of thread from below the fabric to the surface. Reinserting the hook and repeating this operation produces a chain stitch much faster than using a needle. Jacob Kichline’s and Christina Schleifer’s children include: Euphemia (1819-1884) , Jacob (1821-1911), Thomas (1823-1857), Mary Ann (1826-1908), Elizabeth (1832-1890), John Abraham (1835-1907), Charles (1837-1916). 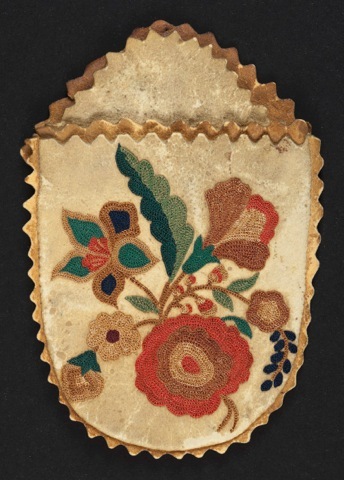 For more detailed information on the Elsabeth Köbler Embroidered Taufschein, see Pennsylvania German Blog Post Nr. 7: The Elisabeth Köbler Embroidered Taufschein. “Jacob Kepler & Maria Christina Kerschner Marriage Entry 5/18/1762,” in Records of St. Paul’s Lutheran and Reformed Church (Blue Church) in Upper Saucon Township, Lehigh County, Pennsylvania, 1748-1892, edited by Clarence E. Beckel. vol. II, p. 186. Bethlehem, Pa., 1939. Sharon P. Angelo et. alia. Quilts: the Fabric of Friendship. Atlgen, Pa.: Schiffer Publishing Ltd. for the York County Heritage Trust, Pa., 2000. Russell D. and Corinne P. Earnest. Papers for Birth Dayes: Guide to the Fraktur Artists and Scriveners, East Berlin, Pa.: Russell D. Earnest Associates, 1997. 2nd ed., vol. 1, pp. 287-290. Linda Eaton. Quilts in a Material World: Selections from the Winterthur Collection. New York: Abrams in association with the Henry Francis du Pont Winterthur Museum, 2007, 68-69. Patricia Herr. Quilting Traditions. Atlglen, PA: Schiffer Publishing Ltd. for The Heritage Center of Lancaster County, 2000. Donald and Nancy Roan. Lest I Shall Be Forgotten: Anecdotes and Traditions of Quilts Green Lane, PA: Goschenhoppen Historians, 1993. Nancy Roan and Ellen Gehret. ‘Just A Quilt’ or Juscht en Deppich. Green Lane, PA: Goschenhoppen Historians, n.d.
Robert Shaw. American Quilts: The Democratic Art, 1780-2007. New York: Sterling Publishing, 2009, 44-45. Klaus Stopp. 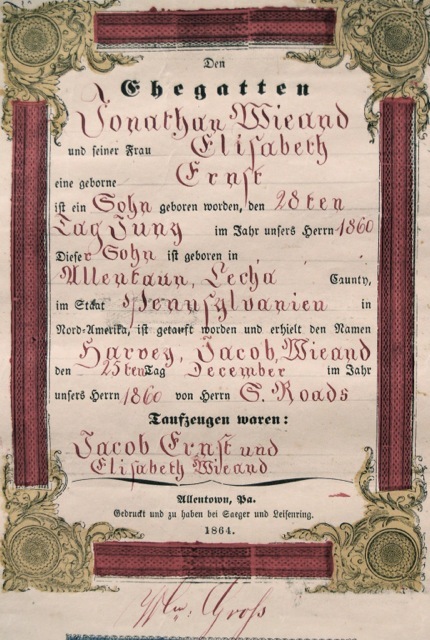 The Printed Birth and Baptismal Certificates of the German Americans, vol.1 of 6. Mainz, Germany and East Berlin, Pa: privately published, 1997-1999. John Joseph Stoudt. Pennsylvania German Folk Art. 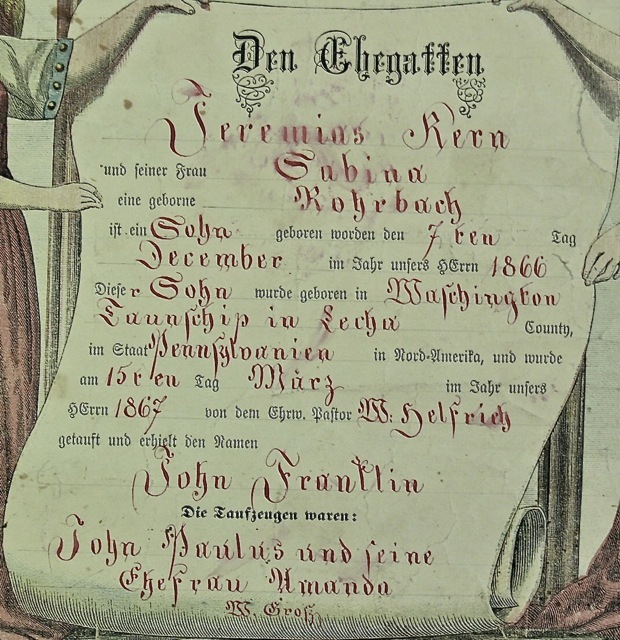 Publications of the Pennsylvnia German Folklore Society, vol. 28, Allentown, Pa: Schlechters, 1966, 334. Thanks to a short-term research fellowship this summer at Winterthur, I have been able to study rare books in the Winterthur Museum Library Collection of Printed Books and Periodicals; objects in the Winterthur Museum Collection; and manuscripts in the Joseph Downs Collection of Manuscripts and Printed Ephemera. 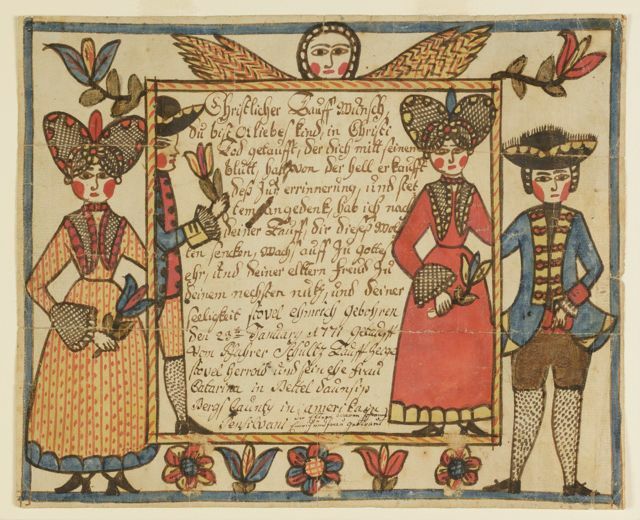 All has contributed to my research for a book in progress Heavenly Fraktur: How Fraktur Influenced Pennsylvania German and Moravian Material Culture. This blog post is based on that research. My sincere thank you to all at Winterthur who have made this fellowship possible. My thanks also to Patricia Herr, Author and Collector; the Rev. James Hammond, and Kathy Exner of St. Paul’s Evangelical Lutheran “Blue Church” of Coopersburg, Pa.; Janine Pollock and Joseph Shemtov of the Rare Book Department at the Free Library of Philadelphia; Joanne Kintner, Pat Gottschalk, Nancy Roan, Linda Szapacs, and Robert Wood of the Goschenhoppen Historians, Inc.; Charlene Donchez, Lindsey Jancay, and Keith Sten of Historic Bethlehem, Inc.; Dorothy McCoach, Independent Textile Conservator; Dave Luz, Candace Perry, and Hunt Schenkel of the Schwenkfelder Library & Heritage Center; Linda Eaton, Tom Guiler, Julia Hofer, Susan Newton, Catharine Roeber, and Roberta Weisberg of Winterthur Museum. This entry was posted in American History, Bucks County, Calligraphy, Folk Art, Fraktur, History, Illuminated Manuscripts, Lehigh County History, Material Culture, Moravian History, Moravians, Needlework, Northampton County History, Pennsylvania Dutch, Pennsylvania German Heritage, Pennsylvania HIstory, Textiles, Uncategorized and tagged Alyssum Enterprises, AlyssumArts, Blue Church, Charles Kichline, Christina Schleifer Kichlein, Del Moyer, Del-Louise Moyer, Dorothy McCoach, Elisabeth Kepler Kichlein, Euphemia Kichlein Scholl, Free LIbrary of Philadelphia, Goschenhoppen Historians, Henry Chapman Mercer, Jacob Kichlein, Johannes Kichlein, John Abraham Kichlein, John Scholl, Mary Ann Kichline Applegate Christine, Metropolitan Museum of Art, Moyer, Patricia Herr, Schwenkfelder Library & Heritage Center, William H. Scholl, Winterthur on September 4, 2016 by Del-Louise Moyer. This blog post is dedicated to Corinne Earnest who left time on May 26, 2016. 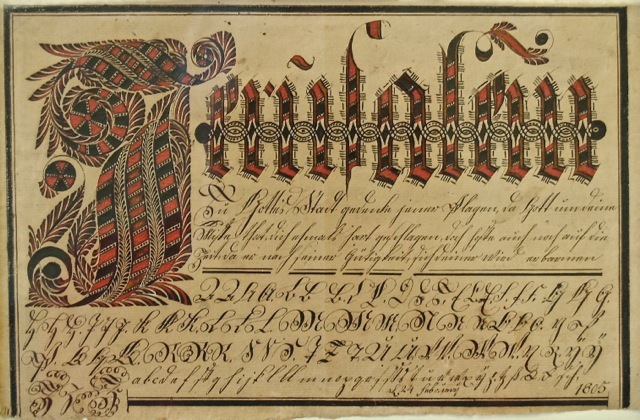 Without Corinne, Patricia, and Russell Earnest’s unflagging dedication to Fraktur, we would all still be trying to put together many of the pieces of the historical puzzle that they have researched, and solved. 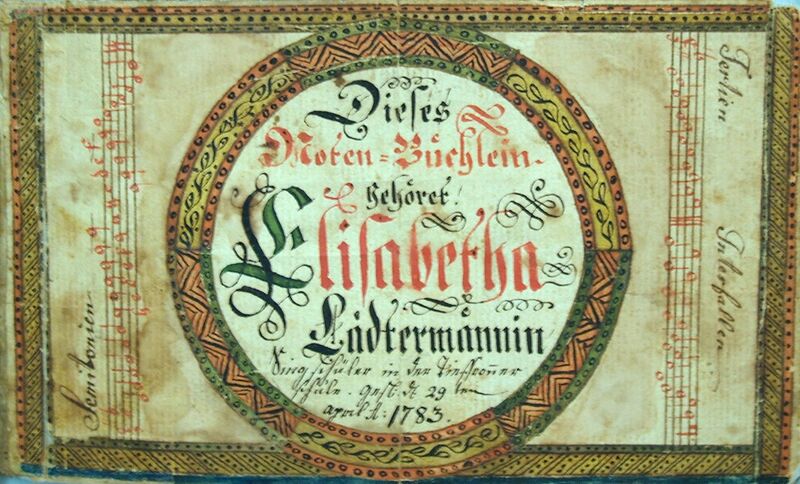 She was not zealous for her own purpose, but rather reached out and shared freely her great love and knowledge of Fraktur with everyone. We all shall miss Corinne. The Pennsylvania Dutch and Moravians produced their everyday tools and utensils from seven media: stone, wood, glass, metal, clay, textiles, and paper. Both decorative Fractur script and motifs, as well as everyday cursive calligraphy adorned this material culture, capturing both the spiritual and secular principles then prevalent. In this post we take a look at the scripts and motifs; the practical aspects of time and materials; and how God spoke to the Pennsylvania Dutch and Moravians through the media. When Adam, father of all mankind, realized his memory wasn’t going to be good enough to remember all the names he had given to earthly living things, he thought he’d better have a talk with God. Now God didn’t want Adam to remember everything, so He said: “Adam, a man can’t keep everything in his head. There should be another way to remember, don’t you think?” Adam, being very relieved, agreed, and so God gave Adam a set of symbols that could be used to keep a record of things. Adam’s children carried on the tradition, and their children’s children, and over time others called these symbols letters or alphabets, and this way of remembering writing. Today, the world over we find varying alphabets, and mankind is still using them to remember. 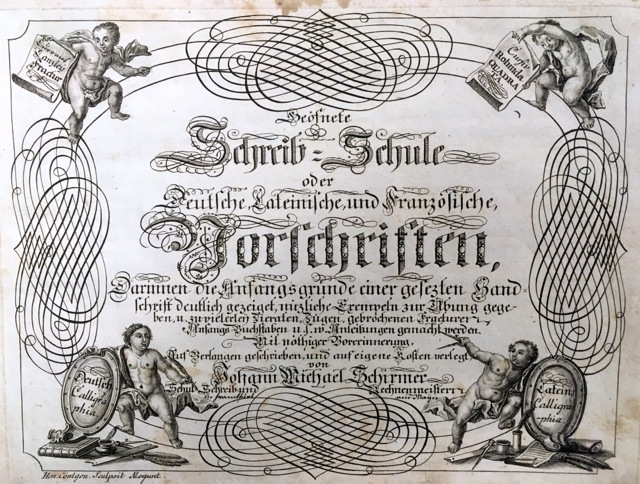 So it was, too, in the eighteenth century when around 1760 people began to ask Johann Michael Schirmer, a writing master, mathematician, and school teacher in the free imperial city of Frankfurt am Main to put together a practical self-instructional handwriting book for the use of young people and adults. Schirmer had very little free time and was reluctant, but finally realized he was the only one who had the broad knowledge and skill necessary to inspire youth to take up the pen and learn to write German in Fraktur, Current, and, chancery scripts, and to notate their Latin, Italian and French in round lettering known as Literae Rotundae and square lettering or Romanae Quadratae. Schirmer’s title page indicates that Current, Canzleÿ, and Fractur are to be understood as German calligraphy, and Cursiva, Rotunda, and Quadrata as Latin calligraphy. Current, also known as German script, was so named, according to Schirmer, because it was “currently” in common use among the general public. He emphasized that his exercises were so designed to teach one to write in this cursive script with ease and clarity as if one letter grew out of the other. Fig. 2 Johann Michael Schirmer. “Von der Current=Schrift überhaupt” or “Concerning Current Script” in Geöfnete Schreib=Schule ….Copperplate 7. Courtesy of Winterthur Museum Library Collection of Printed Books and Periodicals, Wilmington, DE Z43 S33. Canzleÿ or chancery script was created from Fractur quite by accident in the chanceries and scriptoria. As shortcuts were found to speed up the making of initial capital letters, first lines, and other applications in Fractur script, rules were altered. Eventually a whole new set of criteria was recognized under the name of chancery script. Schirmer advises the reader that there was no uniform agreement among writing masters concerning this. Fig. 3 Johann Michael Schirmer. “Von der Canzleÿ=Schrift überhaupt” or “Concerning Chancery Script” in Geöfnete Schreib=Schule…. Copperplate 13. Courtesy of Winterthur Museum Library Collection of Printed Books and Periodicals, Wilmington, DE, Z43 S33. Initially German-speaking calligraphers preferred writing in Fractur, but found it required a great deal of time and skill to do so. This made it unsuitable for everyday situations, and, as already mentioned, encouraged simplification in the rules. So it is not surprising that scribes naturally developed a handwriting for daily use, and eventually designated Fractur exclusively for the ornamentation of initial letters, opening text, and important words in documents. Schirmer notes that only after the introduction of the printing press,  did people begin referring to the script as Fractur. Although there is no proof of this, one thing is certain: Fractur deriving from the Latin word Fractus, and meaning fractured or broken, certainly was used by those printing or handwriting these angular broken letters, and is still used today to describe its fonts and calligraphy. Fig. 4 Johann Michael Schirmer. “Von der Fractur=Schrift überhaupt” or “Concerning Fractur Script” in Geöfnete Schreib=Schule…. Copperplate 21. Courtesy of Winterthur Museum Library Collection of Printed Books and Periodicals, Wilmington, DE, Z43 S33. Schirmer categorizes Cursiva, Rotunda, and Quadrata as Latin calligraphy. Quadrata or Square Capitals were tedious to form because of their straight lines and angular configuration, making them more suitable for carving inscriptions on stone with a chisel than for writing a text on parchment or paper with a pen. Calligraphers, therefore, as with Fractur, in the course of time modified the shape of this script to a rounder lettered form that could be written with a flowing connected hand and speed for everyday use, calling it Cursiva. They reserved the Square Capitals for special headings and text on paper, and used them on readily conducive media such as stone or metal. Intended for cursive handwriting, Schirmer includes large and small Round Letter (Literae Rotundae) alphabets in lower case (Gemeine), as well as decorative upper case (Versalien) examples,. He also introduces Literae Romanae Quadratae (Square Capitals) to be used as ornamental lettering. Fig. 5 Johann Michael Schirmer. “Literae Rotundae…Literae Romanae Quadratae” or “Round Letters…Square Capitals” in Geöfnete Schreib=Schule…. Copperplate 27. Courtesy of Winterthur Museum Library Collection of Printed Books and Periodicals, Wilmington, DE, Z43 S33. For those writing in Latin and French, Schirmer recommends twelve (12) examples in round capital letters to decorate introductory lines. Fig. 6 Johann Michael Schirmer. “Anleitung zu gezierten Lateinisch=und Französischen Anfangs=Zeilen” or “How to Decorate Opening Lines Written in Latin and French” in Geöfnete Schreib=Schule…. Copperplate 45. Courtesy of Winterthur Museum Library Collection of Printed Books and Periodicals, Wilmington, DE, Z43 S33. When writing in German, he suggests using any of the following thirty-eight designs in lowercase Fractur to ornament initial text. Focus on your Creator when young, and have Him ever before your eyes and in your heart. Fig. 8 Johann Michael Schirmer. “Lebens Pflichten der Jugend” or “Youth’s Lifelong Obligaions” in Geöfnete Schreib=Schule….Copperplate 40. Courtesy of Winterthur Museum Library Collection of Printed Books and Periodicals, Wilmington, DE, Z43 S33. Firstly, Faber uses Fractur script for the initial lines as suggested by Schirmer, and chooses a double band decorative element similar to Illustration 7 of “How to Decorate Opening Lines Written in German,” (Copperplate No. 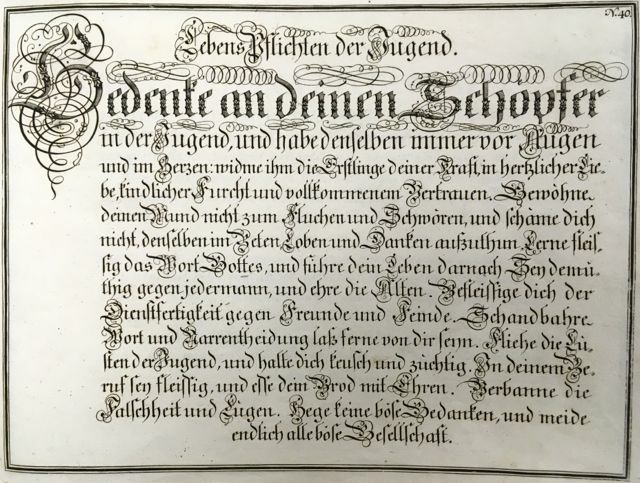 46 ) to ornament the opening religious text “Wohl dem den der Herr in…” Just as Schirmer demonstrates the use of calligraphic flourishes in “Youth’s lifelong Obligations,” (Copperplate No. 40), so too we find Faber embellishing not only the initial letter “W” with flourishes, but also, in similar fashion, all along the top of the line. The religious text in Fractur script paraphrases the Psalmist David, and then in German script quotes verses 9-11 from Psalm 91, demonstrating the every day cursive handwriting the student is more likely to use throughout his life. The upper and lower case alphabets in Current script are included for practice purposes. The final line Johannes Klinger’s Writing Sample, 28th November 1812 is important text identifying the owner, and, accordingly is also done in Fractur. Fig. 9 Wilhelmus Faber Vorschrift for Johannes Klinger, 1812. Courtesy of the Henry Stauffer Borneman Collection at the Free Library of Philadelphia, (FLP) frk00359. He whom the Savior blesses in his work and household shall prosper. For the Lord is your refuge, and the Most High your deliverance. No evil will befall you, and no plague come nigh unto your dwelling. For He has entrusted you to his angels that they may protect you wherever you may be [Psalm 91:9-11]. Faber was most likely a school teacher, and is best known for his decorative Scherenschnitte or cutwork that frequently encircles the text. However, he also made writing samples such as the FLP example. It has been suggested that he was Moravian since he reputedly once lived in Lititz, Pennsylvania, a Moravian community in northern Lancaster County. He was also, however, active in Berks, Bucks, Chester, Dauphin, Lebanon, Montgomery and Northampton Counties. Knowledgeable in German, Latin, and English, his calligraphy is remarkably fine, and that of a trained scrivener. 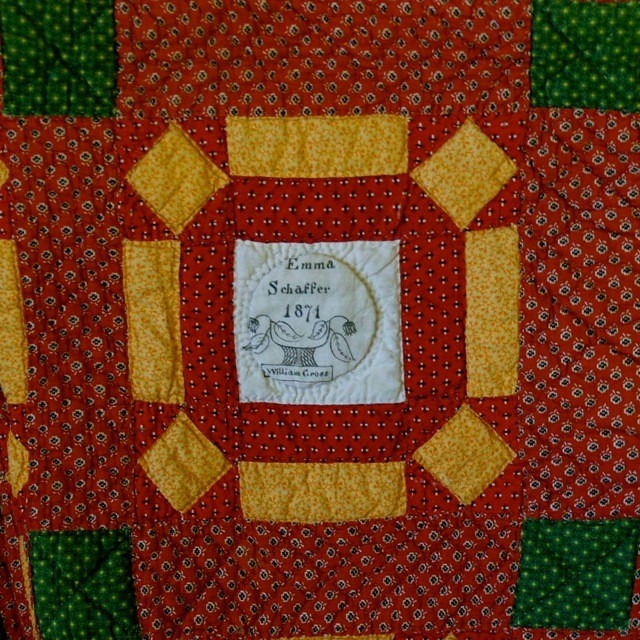 Elisa Kulp, a Mennonite living in the Franconia area of Montgomery County Pennsylvania, worked a most extraordinary sampler in 1816. 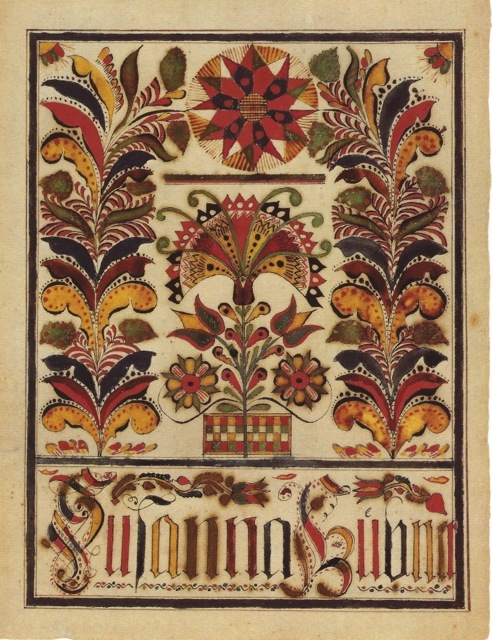 An A B C sampler with square capital letters in the upper half, along with floral and geometric designs in the lower ensured that she would be able to number and mark her linens with her name or initials for inventory, as well as have a template of decorative motifs to embellish other textiles throughout her life. It is worthwhile pointing out that household textiles were highly valued, and an important part of one’s estate. MEIN GOTT ICH BITT | DURCH CHRISTI BLUT | MACHS DOCH MITT | MEINEM ENDE GUT or MY GOD I ASK YOU THROUGH THE BLOOD OF CHRIST TO ASSURE ME A PEACEFUL END. O EDEL HERZ BEDENKE DEIN ENDE or O NOBEL HEART CONTEMPLATE YOUR END. The origin or inspiration of these phrases can be traced to Ämilie Juliane, Imperial Countess of Schwartzburg-Rudolstadt (1637-1706), who was born in 1637 in Barby, a place which in the eighteenth century was to become strongly associated with the Moravians. Like Luther, this noble lady considered prayer and diligence key necessities to one’s life, meditating three times daily. She died in Rudolstadt in 1706. 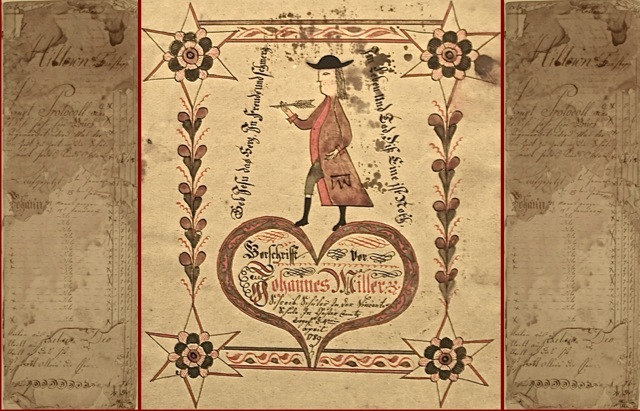 Ämilie Juliane is known to have written over 500 hymns, one of which Die Eile des Lebens or The Hurriedness of Life contains the phrase Elisa cross-stitched “Mein Gott ich bitt durch Christi Blut Machs doch mit meinem Ende gut.” This refrain comes at the end of each of twelve verses, “My God, my God, I ask you through the blood of Christ to assure me a peaceful end.” The beginning of the third verse “Lord, teach me always to contemplate my end,” or “Herr, lehr mich stets mein End gedenken’ may have inspired Elisa to encircle a flowering heart motif in the center of the bottom half of her sampler with the entire command “O Edel Herz Bedenke Dein Ende” or “O Noble Heart, Contemplate your End.” This was a saying near and dear to the Pennsylvania Dutch and appeared frequently on samplers and towels in the abbreviated form OEHBDDE. There are two kinds of Pennsylvania Dutch and Moravian redware: the greater majority falls under utilitarian in glazed, unglazed, or partly glazed ware; and a much smaller group of “fancy” glazed and decorated ware. 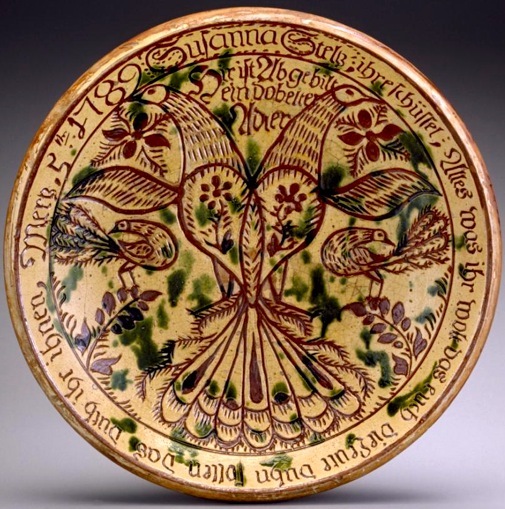 Georg Hübner, a potter in Limerick Township, Montgomery PA made a slip decorated, sgrafitto dish thirteen inches in diameter for Susanna Steltz in 1789 that falls into the latter category. Slipware refers to glazed pieces that have had an element of design added such as a drawing, date, name, or saying. For sgraffito, from the Italian for “scratched,” the slip is painted on the surface and the design is scratched through the slip revealing the contrasting red clay beneath. Although such a piece showed off the potter’s skills, and was less likely to be used daily, there is evidence from marks of wear and tear on some that not all were presentation pieces. The Steltz piece, however, appears to have been rarely used, and does, indeed, demonstrate Hübner’s masterful work. The potter inscribed the outer rim of the plate in Fractur script with a command Jesus gave to the multitude in his sermon on the Mount found in chapters 5-7 of St. Matthew, and chapter 6 of St. Luke—specifically Matthew 7:12, and Luke 6:31, as well as the date and name of the plate owner: “ March 5th 1789 the plate of Susanna Steltz. All that you would have others do unto you, do unto them.”  The inner portion is decorated with a double-headed eagle as per the Fractur script between the two heads: “Portrayed here is a double-headed eagle.”  Please note that this is not a Holy Roman Empire double-headed eagle bristling with authority and might, but rather a double-headed eagle of totally different temperament to whom Hübner gave a broad and flowering Pennsylvania Dutch heart. Fig. 10 Redware (slip decorated, sgraffito) by Georg Hübner, Limerick Township, Montgomery County, March 5, 1789, Courtesy Winterthur Museum Collection, Wilmington, DE, 965.2301. Radiant-heat stoves existed in northern Europe as far back as the mid-sixteenth century. The tradition of casting them in iron with low relief decorative and textual elements, both secular and religious, also originated on the Continent. Some of the eighteenth-century German-speaking immigrants to Pennsylvania brought these cast iron stoves along with them to heat their homes, and when they needed to replace or repair damaged or worn plates, found iron masters who could replicate the traditional plates at local forges. The Pennsylvania Dutch house in the mid- to late eighteenth century consisted of three rooms on the main floor: a Küche or kitchen on one side of a centrally-located chimney, and a family living space known as the Stube or “room,” as well as the Kammer or “sleeping chamber” on the other. The fireplace opened into the kitchen and, just as in Europe, the most economical way to heat the Stube was via the cast iron five-plate jamb stove, which when put together, formed an open box that could be put against an opening in the wall shared with and opening into the kitchen fireplace. Placing hot coals or burning wood from the fireplace side into the stove opening provided heat in the Stube without the annoyance of smoke. These plates were made in the same way as in Europe, and typically were adorned with secular or religious inscriptions done in Romanae Quadratae or Capital Square Letters. Fractur visual motifs such as tulips, stars, medallions, wheat sheaves, and human figures often depicted a Biblical story with or without a saying, reminding the viewer of his temporal existence, and need to take stock of the eternal path he was forging. This stove plate’s message was easily understood by the denizens of southeastern Pennsylvania in 1753, and although we don’t yet know the true significance of its imagery and text, we can at least contemplate both its visual, and verbal elements. 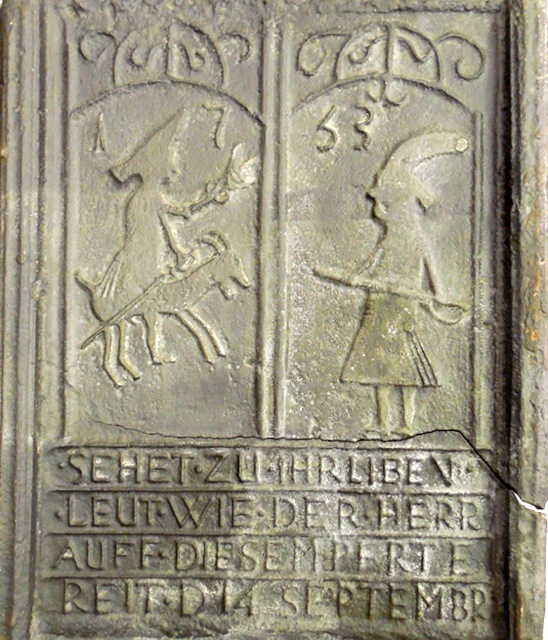 Two vaulted panels are divided by a vertical molding: At the top on the left in relief are the letters “17.” In the center a rider, in tricorn hat and long coat, clenches a sword in right hand, while holding aloft possibly a torch in his left hand. He conspicuously sits upon a goat. 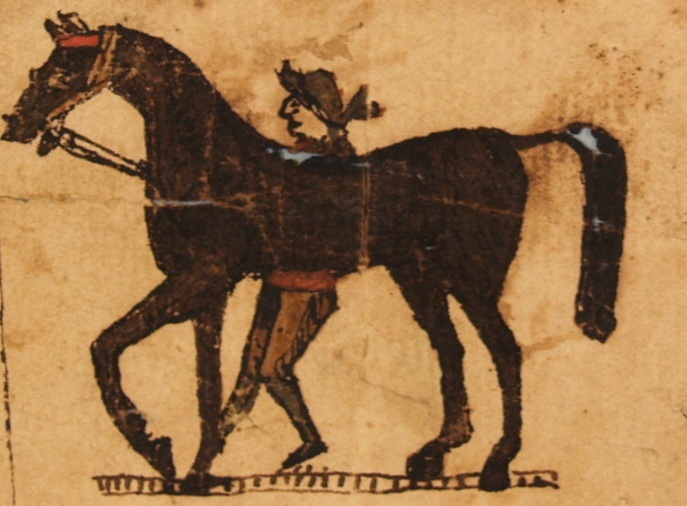 At the top on the right are the letters “53.” In the center a man on foot, wearing a headdress and long coat faces the rider, and with both hands holds a sword in horizontal position in front of him. AUFF . DIESEM PFRTE RIDES UPON THIS HORSE. Johannes Gutenberg introduced the first movable type printing press in Mainz ca. 1440. “Youth’s Obligations Towards Life,” a translation of Schirmer’s writing sample “Lebens Pflichten der Jugend,” in Geöfnete Schreib=Schule…Franckfurt am Maÿn: Selbstverlag, ca. 1760, copper plate No. 40. For original Fraktur script see Fig. 8. The following is a transcription thereof: Bedenke an deinen Schöpfer | in der Jugend, und habe denselben immer vor Augen | und im Herzen: widme ihm die Erstlinge deiner Kraft, in hertzlicher Lie= | be, kindlicher Furcht und vollkommenem Vertrauen. Bewohne | deinen Mund nicht zum Fluchen und Schwören, und schäme dich | nicht, denselben im Beten, Loben und danken aufzuthun. Lerne fleis= |sig das Wort Gottes, und führe dein Leben darnach [.] Sey demü= | thig gegen jedermann, und ehre die Alten. Befleissige dich der | Dienstfertigkeit gegen Freunde und Feinde. Schandbahre | Wort und Narrentheidung laß ferne von dir seyn. Fliehe die Lüs= | sten der Jugend, und halte dich keusch und züchtig. In deinem Be= | ruf sey fleissig, und esse dein Brod mit Ehren. Verbanne die | Falschheit und Lügen. Hege keine böse Gedanken, und meide | endlich alle böse Gesellschaft. “He Shall Prosper Whom the Savior Blesses,” a translation of Wilhelmus Faber’s 1812 Johannes Klinger Vorschrift. For original Fractur and German script, see Fig. 9. The following is a transcription thereof: Vorschrift der Liebhabern zum Lesen und Schreiben, 1812. Wohl dem, den der Herr in | seiner Arbe[i]t segnet, und seine Haushaltung beglücket. |[Luther Bibel, 1545; Psalm 91: 9-11] Denn der Herr ist Deine Zuversicht der Höchste ist Dein Zuflucht. Es wird Dir kein |übels [sic] begegnen, und keine Plage wird zu Deiner Hütte sich nahen. Denn er hat seinen [sic] | Engel befohlen über Dir, daß sie Dich behüten auf allen Deinen Wegen. Ellen Gehret, This is the Way I Pass My Time: A Book About Pennsylvania German Decorated Hand Towels (Birdsboro, PA: Pennsylvania German Society, 1985), 5. For original Fractur script, see Fig. 12. 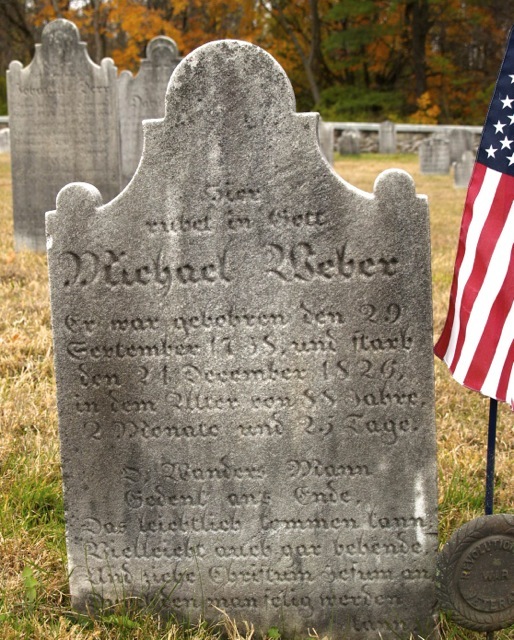 The following is a transcription of the tombstone: “Hier | ruhet in Gott | Michael Weber | er war gebohren den 29 . | September 1738, und starb | den 24 . December 1826, | in dem Alter von 88 Jahre, | 2 Monate und 25 Tage. | O, Wanders Mann | Gedenk ans Ende. | Das leichtlich kommen kann; | Vielleicht auch gar behende, | Und ziehe Christum Jesum an, durch den man selig werden | kann. Arthur Cecil Bining. Pennsylvania Iron Manufacture in the Eighteenth Century. Harrisburg: PA Historical Commission, 1938. “Wilhelmus Antonius Faber” in Russell D. and Corinne P. Earnest, Papers for Birth Dayes: Guide to the Fraktur Artists and Scriveners. East Berlin, Pa.: Russell D. Earnest Associates, 1997, 2nd ed., vol. 1, 264-265. 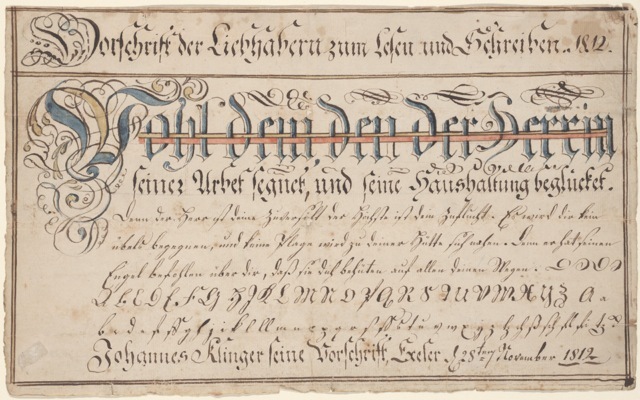 Wilhelmus Faber’s Johannes Klinger 1812 Vorschift in Henry S. Borneman, Pennsylvania German Illuminated Manuscripts. Norristown, Pa.: Pennsylvania German Society, 1937, published as plate 3. Ellen Gehret. This is the Way I Pass My Time: A Book About Pennsylvania German Decorated Hand Towels. Birdsboro, PA: Pennsylvania German Society, 1985. Tandy and Charles Hersh. Samplers of the Pennsylvania Germans. Birdsboro, PA: Pennsylvania German Society, 1991. Stacy C. Hollander et al., American Radiance: The Ralph Esmerian Gift to the American Folk Art Museum Catalog. New York: Harry N. Abrams, 2001, 141-142, no. 104 [Georg Hübner]. Catherine E. Hutchins., et al. Arts of the Pennsylvania Germans. New York, NY: Published for the Henry Francis du Pont Winterthur Museum by Norton: 1983. Henry J. Kauffman and Quentin H. Bowers. Early American Andirons and Other Fireplace Accessories. Nashville, Tn: Nelson . Henry J. Kauffman. American Copper & Brass. [Camden, N.J.]: T. Nelson . _______________. Early American Ironware: Cast and Wrought. Rutland, Vt.: C.E. Tuttle Co., 1966. _______________. Pennsylvania Dutch: American Folk Art, New York: Dover Publications, , 94-95 [Georg Hübner]. Henry Chapman Mercer. 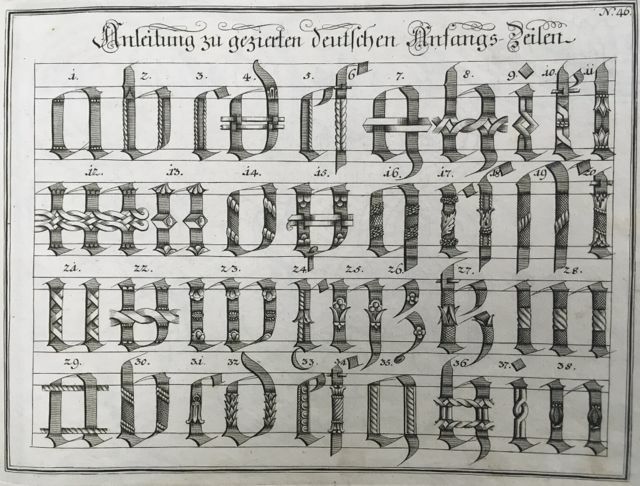 The Survival of the Mediaeval Art of Illuminative Writing Among Pennsylvania Germans. [Doylestown, Pa: Bucks County Historical Society], . Lisa Minardi. A Colorful Folk: Pennsylvania Germans & the Art of Everyday Life. Winterthur, DE: Henry Francis du Pont Winterthur Museum, Inc., 2015, fig. 20, 22 [Georg Hübner]. 1650-1850 . New York: A. A. Knopf, 1993. Earl F. Robacker. “Pennsylvania Redware,” in Pennsylvania Folklife. Vol. 46, No. 3 (1997), 137-142. Pennsylvania Folklife Magazine. Book 150. Accessed 26 July 2016 http://digitalcommons.ursinus.edu/pafolklifemag/150 [Georg Hübner]. Margaret B. Schiffer. Historical Needlework of Pennsylvania. New York: Scribener, 1968. Johann Michael Schirmer. Geöfnete Schreib=Schule oder Deutsche, Lateinische, und Franzöische Vorschriften. Frankfurt am Maÿn: Selbst Verlag, ca. 1760. John J. Stoudt. Pennsylvania German Folk Art: An Interpretation. Allentown, Pa.: Schlecters, 1966, 313 [Georg Hübner]. Swan, Susan Burrows. A Winterthur Guide to American Needlework. Winterthur, Del. : Henry Francis du Pont Winterthur Museum, 1976. _______________. Plain & Fancy: American Women and Their Needlework, 1650–1850. Austin, Texas. : Curious Works Press, 1995. Marjie Thompson, Kathleen L. Grant and Alan G. Keyser. Forgotten Pennsylvania Textiles of the 18th and 19th Centuries. Cumberland, ME: Linen Press, [2005?]. Daniel Berkeley Updike. Printing Types Their History, Forms, and Use: A Study in Survivals. Cambridge:Massachusetts: The Belknap Press of Harvard University Press, 1962, 2 vols. Thanks to a short-term research fellowship this summer at Winterthur I have been able to study rare books such as Johann Michael Schirmer’s ca. 1740 Geöfnete Schreibschule in the Winterthur Museum Library Collection of Printed Books and Periodicals; objects in the Winterthur Museum Collection; and manuscripts in the Joseph Downs Collection of Manuscripts and Printed Ephemera. 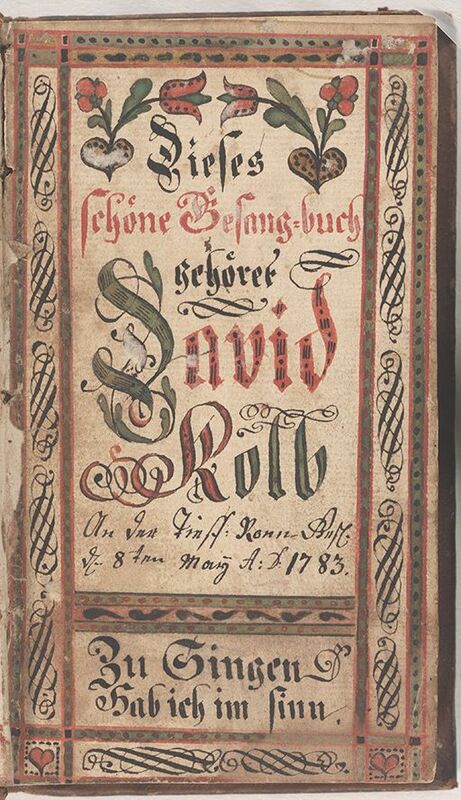 All has contributed to my research for a book in progress Heavenly Fraktur: How Fraktur Influenced Pennsylvania German and Moravian Material Culture. This blog post is based on that research. My sincere thank you to all at Winterthur who have made this fellowship possible. My thanks also to Donald Trump of the Friedensville Evangelical Lutheran Church; Joanne Kintner and Robert Wood of the Goschenhoppen Historians, Inc.; Patricia Herr, Author and Collector; Dorothy McCoach, Independent Textile Conservator; Janine Pollock and Joseph Shemtov of the Rare Book Department at the Free Library of Philadelphia. This entry was posted in American History, Berks County History, Calligraphy, Ceramics, Folk Art, Fraktur, History, Illuminated Manuscripts, Lutheran, Material Culture, Mennonite, Metals, Montgomery County History, Moravian History, Moravians, Needlework, Northampton County History, Pennsylvania Dutch, Pennsylvania German Heritage, Pennsylvania HIstory, Pottery, Stone, Textiles, Uncategorized and tagged Alyssum Enterprises, AlyssumArts, Del Moyer, Del-Louise Moyer, Dorothy McCoach, Earnest Archives & Library, Elisa Kulp, Free LIbrary of Philadelphia, Friedensville Church, Geöfnete Schreibschule, Georg Hübner, Henry Stauffer Borneman, Johann Michael Schirmer, Johannes Klinger, Michael Weber, Moyer, Patricia Herr, Susannah Steltz, Wilhelmus Antonius Faber, Winterthur on July 29, 2016 by Del-Louise Moyer.